A successful ground test of a system designed to ultimately collect solar power from orbit and beam it back down to Earth was announced in Japan this week by Mitsubishi Heavy Industries. The wireless power demonstration saw 10 kilowatts sent over microwaves from a transmitting unit to a receiver 500 meters (1,640 ft) away. Mitsubishi says the reception of the power sent through the air was confirmed through the illumination of lights using part of the power transmitted. The company did not confirm what percentage of the power sent actually made it to the receiver, however, which is a key question as the ultimate goal is to relay power from orbit thousands of miles above Earth. Previous tests of the technology yielded only a tiny fraction of the power sent from one Hawaiian island to another. No one is expecting a huge orbiting solar farm and corresponding massive microwave power beam to be ready overnight, of course. Mitsubishi says that the successful test conducted at the company’s Kobe Shipyard and Machinery Works has verified the viability of the concept, and that the transmission distance and power load mark new milestones for the technology. Perhaps just as important, the testing confirmed the performance of the control system that will regulate the microwave beam itself. This is a big deal, because if the proposed microwave connection between an orbiting power station and large receiver units on a man-made island in Tokyo Bay were ever fired up at full power, it would be strong enough that workers would need to wear protective clothing – not the kind of thing you’d want to zap 100,000 people wandering through Shinjuku with by accident. The testing was conducted with Japan Space Systems, a quasi-governmental non-profit carrying out the solar power wireless transmission project. 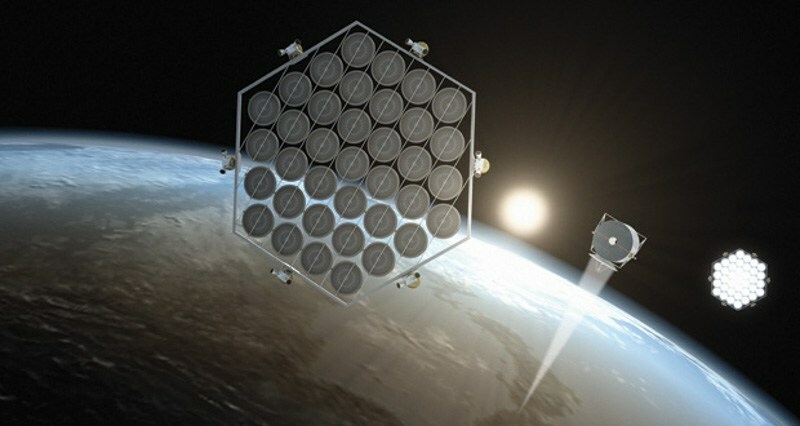 While successfully beaming power from the sun to Earth via an orbiting system of collectors at a large scale may be decades away, cost billions of dollars and require the invention of some new technologies, the investment can be justified for a country like Japan with limited natural resources, that’s still reeling from the Fukushima nuclear disaster. Mitsubishi also sees less ambitious applications for the technology, like wirelessly powering electric vehicles on Japan’s roads.